“On June 27, 2016, Attorney General Loretta Lynch met with former President Bill Clinton on board a parked plane at Sky Harbor International Airport in Phoenix, Arizona. The meeting occurred during the then-ongoing investigation of Mrs. Clinton’s email server, and only a few days before she was interviewed the Justice Department and FBI. (Judicial Watch filed a request on June 30 that the U.S. Department of Justice Office of the Inspector General investigate that meeting. )” – Jill Farrell, Director of Communications, Judicial Watch. Many American cops saw right through Comey’s inaction against Mrs. Clinton: He’s a dirty cop who let a major crime figure walk. On Thursday, in the middle of a number of top news stories, a well-known watchdog organization released a 29-page Federal Bureau of Investigation (FBI) file directly related to the controversial June 27, 2016 Phoenix, Arizona, airport tarmac tête-à-tête between then Attorney General Loretta Lynch and her boss’ predecessor former President Bill Clinton, according to Judicial Watch’s director of communications, Jill Farrell. 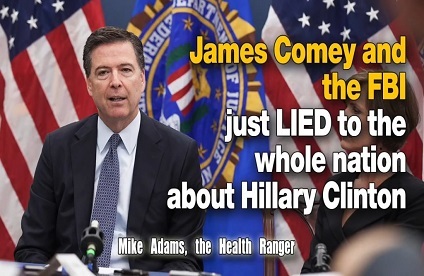 Perusal of these latest government documents reveals that then FBI Director James Comey and his underlings were more concerned about leaks of that meeting being reported in the media than the actual Lynch-Clinton meeting itself. The new documents also show that then-FBI Director Comey seemed to learn of the meeting from news reports. These latest FBI documents show how the agency’s officials were concerned about a leak that Bill Clinton delayed his aircraft taking off in order to “maneuver” a private meeting with his predecessor’s attorney general. The breaking story in the Observer is seemingly confirmed and causes a flurry of emails about the source of the article. FBI official(s) write “we need to find that guy” and that the Phoenix FBI office was contacted “in an attempt to stem any further damage.” Another FBI official, working on AG Lynch’s security detail, suggests instituting non-disclosure agreements. The names of the emails authors are redacted. There are no documents showing concern about the meeting itself. The FBI has allowed itself to become as corrupt as the criminals they arrest. On June 27, 2016, Attorney General Loretta Lynch met with former President Bill Clinton on board a parked plane at Sky Harbor International Airport in Phoenix, Arizona. The meeting occurred during the then-ongoing investigation of Mrs. Clinton’s email server, and only a few days before she was interviewed the Justice Department and FBI. Judicial Watch filed a request on June 30, 2016, that the U.S. Department of Justice Office of the Inspector General investigate the suspiciously timed meeting between the head of the government agency investigating a presidential candidate’s suspected criminal acts and the candidate’s husband who was a two-term POTUS. 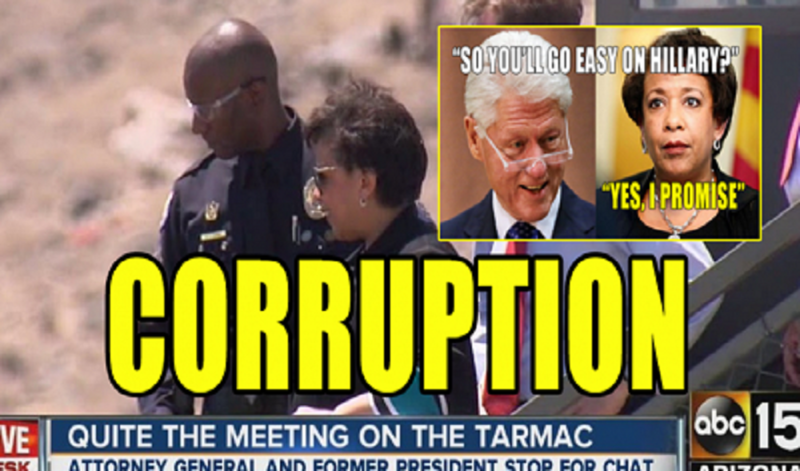 “The tarmac meeting also came just days before former FBI Director James Comey held the July 5, 2016, press conference in which he announced that no charges would be filed against Mrs. Clinton. In his subsequent, May 3, 2017, testimony before the Senate Judiciary Committee, Comey claimed the Lynch-Clinton tarmac meeting was the “capper” among “a number of things” that had caused him to determine that Department of Justice leadership “could not credibly complete the investigation and decline prosecution without grievous damage to the American people’s confidence in the justice system,” Jill Farrell noted in her released statement.